Professor Sten Widmalm and his book. The blow that put a definite halt to the consolidation of democracy and the integration of Jammu and Kashmir came on 2 July 1984, when Farooq was told by the new Governor, Jagmohan, that his party had lost its majority in the state Assembly through the defection of thirteen Members of the Legislative Assembly (MLAs), twelve belonging to the National Conference and one independent. The group quickly proposed to form a new government with outside support from the Congress (I). This caused an angry reaction and was criticised as constitutional and undemocratic. Jagmohan had asked Farooq Abdullah to step down without letting him test his support on the floor of the Assembly and the central government was accused of having plotted the dismissal. Disillusionment with democratic institutions and contempt for the central government increased dramatically in Jammu and Kashmir after the dismissal of Farooq Abdullah and the political developments that followed. Therefore it is important to investigate how and why this happened. Even if the road to democracy was bumpy and the bureaucracy and the parties were plagued by corruption, democracy in Jammu and Kashmir was being consolidated until this fatal change of direction took place. Why did Farooq Abdullah have to be dismissed at such cost to the political development of Jammu and Kashmir? The former Jammu and Kashmir Governor Jagmohan claims that he acted in the national interest and that he had to take action against Abdullah who, he alleges, was not taking a firm stand against pressure from terrorists in Punjab and Pakistan. He adds that Farooq Abdullah had lost his support in the Assembly with the defection of the MLAs to Congress (I). Jagmohan, therefore, concludes that he only did what was expected of him in the summer of 1984. The course of events was as follows. Late on the evening of 1 July, Jagmohan (see p 276 My Frozen Turbulences by Jagmohan Malhotra) was informed that a group of MLAs in the National Conference, led by Ghulam Mohammed Shah, Farooq Abdullah’s brother-in-law, and Devi Das Thakur, the High Court Lawyer and former Finance Minister in the state, planned to withdraw support from Farooq Abdullah and form a new government with the backing of Congress (I). With Thakur’s assistance, Shah was about to take over the highest office in the state. 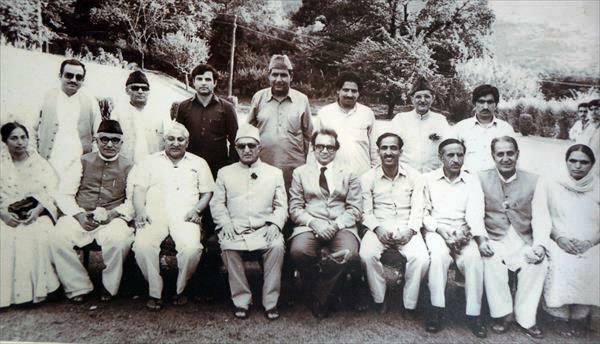 The cabinet of Ghulam Mohammad Shah on July 2, 1984 with governor Jagmohan at the centre, after 13 NC lawmakers defected and brought down Dr Farooq Abdullah’s government. National Conference had lost its majority, Jagmohan could impose Governor’s Rule. (see Jagmohan, p 284-85) Farooq returned home and, after meeting his Cabinet, replied by letter that ‘democratic traditions require that the question of loss of confidence should always be tested on the floor of the House’ and that Jagmohan should, therefore, summon the Legislature for this purpose. Jagmohan claims that ‘the surcharged atmosphere’ did not allow the Assembly to convene and that he was disappointed by Farooq Abdullah’s failure to accept the option of Governor’s Rule. Nevertheless, when Jagmohan contacted Indira Gandhi at 11 am on 2 July, she gave her blessing to the Governor’s Rule suggestion. Shah and Thakur, naturally, were not happy to hear this. But then, according to Arun Nehru, a relative to the Nehru-Gandhi family who was working closely with Rajiv Gandhi and Indira Gandhi at the time, the Cabinet Sub-Committee on Political Affairs overruled the option and said ‘let there be a split in the National Conference – Shah will not last a year.’ At 3:00 p.m. the Cabinet Sub-Committee’s decision was communicated to Jagmohan, who argues that he, therefore, had no course but to swear in Shah. The criticism levelled against Jagmohan is that he should have allowed Farooq Abdullah to test his support on the floor instead of unquestioningly carrying out the orders of the central government. In his defence, Jagmohan argues that this charge is baseless in that when arguing for Governor’s Rule, he was, in fact, opposing the central government, which advocated that Shah should be installed. (see p 293, Jagmohan) But there is a good deal to be said in response to Jagmohan’s defence against his critics. To begin with, the central government, and in particular Indira Gandhi had obviously decided that Farooq Abdullah had to be removed from power. Since both the options considered by Jagmohan (imposing Governor’s Rule or putting Shah in charge) included this objective, it may still be argued that he was going along with the central government, and not opposing it. Important evidence of this declared intention is found in several places. By the spring of 1984, it was common knowledge that Indira Gandhi wanted to remove Farooq Abdullah from office, but the following information shows that a scheme to do this was hatched only a few months after the 1983 election. We should first consider this newspaper report (Revolt In The Making, Tribune, September 2, 1983) from September on political developments in Jammu and Kashmir, which revealed that an alliance had been made that took everyone by surprise. 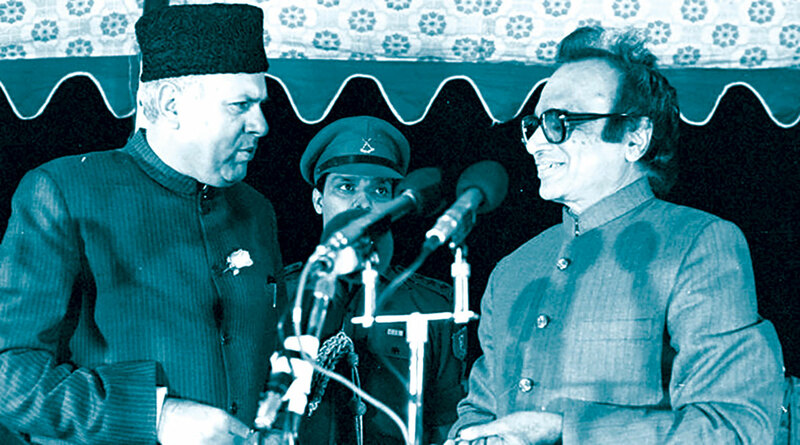 Jagmohan swears in Farooq Abdullah as CM in 1986. Jagmohan oversaw two spells of Governor’s rule. The report suggests that the conflict that was resolved between Shah and Thakur was mainly an affair at state level motivated by the wish to overthrow a common political enemy. There are indications, however, that the scheme originated in higher spheres, namely in the central government and the Prime Minister’s office. With surprising frankness, Thakur explains (in an interview with the author on December 3, 1994) what happened behind the scenes and how Indira Gandhi called him in to discuss the removal of Farooq Abdullah from power immediately after the election. After this meeting, Farooq Abdullah was under constant attack from two fronts. Shah and Thakur were set on splitting the party from within. By the spring of 1984, this had gone so far that Shah and Farooq Abdullah were holding separate party conventions. This split also prepared the way for the defection later in the summer. The so-called floor-crossing could have been considered illegal under the constitutional law of Jammu and Kashmir State. Since the party had held two separate conventions, however, the High Court later ruled the defection of the twelve MLAs legal, since the party was considered to have split. This outcome was most certainly anticipated by D D Thakur, an experienced lawyer and now the supporter of Shah. Consequently, bringing the international cricket match to the disputed territory was always a provocation to the Jamaat-e-Islami. It was a provocation in 1978 and also in 1983 simply because the party had always criticized the accession. 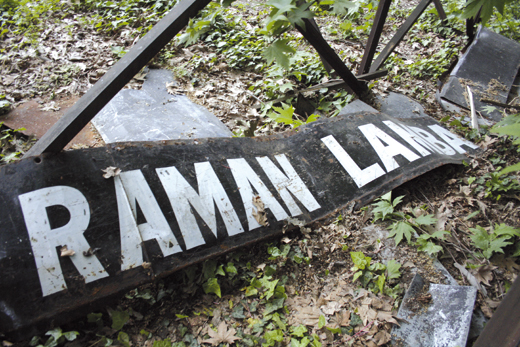 Caution is therefore advisable in drawing far-reaching conclusions about the political climate in general in Jammu and Kashmir, such as those drawn by Lamb and the central government in 1984, from the cricket-match incident alone. It is more important to point out another difference that may explain the strong reactions of the central government in 1984. In 1978 Sheikh Abdullah was at peace with the central government, and in 1983 Farooq Abdullah was not. After the incident in 1983, Indira Gandhi expressed her serious concern over developments in Jammu and Kashmir and the fact that Farooq Abdullah was not taking necessary and stern measures against the “insurgents.” More criticism, implicit or explicit, of Farooq Abdullah, followed. In January 1984 Indira Gandhi warned that she would not accept any anti-national activities in Jammu and Kashmir. A month after that, Rajiv Gandhi publicly predicted an invasion of Jammu and Kashmir by Pakistan, and a few weeks later Congress (I) members claimed that Farooq Abdullah was a member of the JKLF. The message from the central government was, however, quite clear. Farooq Abdullah was officially portrayed by the Congress (I) as a threat to national security and hence ought to be ousted. Now, there was only one obstacle. B K Nehru, another relative of Indira Gandhi, was the Governor of Jammu and Kashmir, and he was not willing to accede to the plans of the central government. 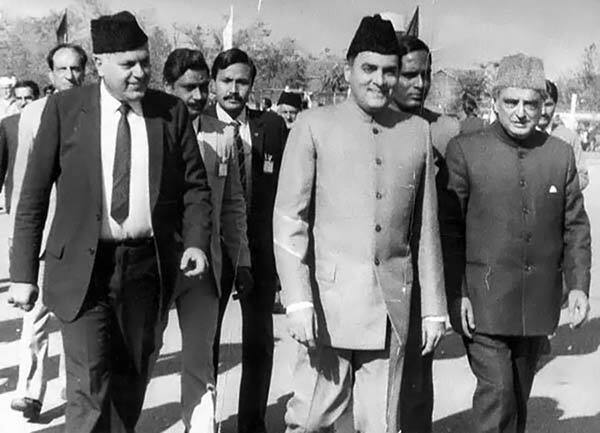 As union Tourism Minister, Mufti Sayeed (R) accompanying the then PM, Rajiv Gandhi, with Dr Farooq Abdullah. According to B K Nehru, the central government tried to persuade him to remove Farooq Abdullah ‘every day.’ Nehru, however, did not welcome the attempts of the central government to intervene because he did not accept the truth of the accusations. It should also be mentioned that Farooq Abdullah and B K Nehru were good friends When Farooq Abdullah was uneasy about the recommendations of his personal advisor, PL Handoo, he used to meet B K Nehru, sometimes over a drink, and discuss his problems with him. However, this friendly relationship did not stop Farooq Abdullah from putting B K Nehru in a difficult position. At the time when Farooq Abdullah was being most severely criticized by the central government on the law-and-order situation in Jammu and Kashmir, he was called to a meeting with the Prime Minister in New Delhi on 24 January 1984 amidst a tense atmosphere. National Conference supporters had clashed with members of the Congress (I) on several occasions during the past month, and finally, in one confrontation, six members of the Congress (I) had been killed. Arun Nehru recalls (in an interview with the author) how he tried to bring Farooq Abdullah ‘in line,’ but without success. ‘Now, you listen,’ I told Farooq. ‘You listen when the PM speaks. Mrs Gandhi had clearly said that it only takes one signature to get rid of Farooq.’ So he begged for mercy, he was told to behave by Mrs Gandhi, and he got a second chance and he went back, and the first thing he does when he comes home is to take a vote of confidence! This was his disaster and a most stupid thing to do. Farooq Abdullah explains in My Dismissal that he understood that there was a ‘conspiracy to dismiss’ him after the meeting in New Delhi (see p 9). On 27 January, therefore, he took measures to protect his position by seeking a vote of confidence in the Legislative Assembly. His victory in this vote was popular in Jammu and Kashmir, but it definitely made his enemies more determined to remove him from power. It also seems that Farooq Abdullah lost some of the sympathy of his powerful ally at the same time. B K Nehru was disappointed that Farooq Abdullah had demanded the vote in the Assembly without advance notice, which was unconstitutional. This did not make things easier for B K Nehru, who was defending Abdullah on constitutional grounds. Furthermore, it seems that B K Nehru acted as a guarantor for Farooq Abdullah in New Delhi when it was agreed that there should be no further provocation of the central government. The vote of confidence that followed soon after Farooq Abdullah’s return to Jammu and Kashmir was perceived as a breach of that ‘understanding.’ (see Jagmohan p 294-95) The upshot was that the central government decided it was time for a change of regime in Jammu and Kashmir. Or, as Arun Nehru described it: ‘A hostile government in a sensitive border state became unacceptable.’ In April, Jagmohan was sent in by the central government to replace B K Nehru as Governor of Jammu and Kashmir. B K Nehru was transferred to Gujarat. After that, Shah declared that ‘the real National Conference’ would hold its convention on 23 May. Farooq Abdullah held a separate convention with his group of followers a few days later. This action by the ‘splinter group’ led by Shah and the High Court lawyer Thakur, was instrumental, in the High Court’s subsequent ruling that the defection in July was legal. Meanwhile, on 28 June the letter of defection was signed by the MLAs. Arun Nehru was later accused of having bribed the defectors. To this he comments ‘That was never needed. What more can somebody want than to become Chief Minister and these MLAs were happy to do it anyway.’ Consequently, Shah finally became Chief Minister, Thakur became Deputy Chief Minister, and all the defectors received portfolios in the new Government. The support from the central government was strong and the Union Home Minister declared that Jagmohan had ‘not committed any unconstitutional impropriety’ in dismissing the Farooq Abdullah Ministry (see The Indian Express July 27, 1984). Nevertheless, the new Government clearly lacked legitimacy. In the media and among the political elites the dismissal of Farooq Abdullah was generally regarded as unconstitutional and as a breach of democratic norms. The events of 1983 and 1984, mark the beginning of the drastic decline of democracy in Jammu and Kashmir, and it is important to take note that what characterizes the conflict today has little to do with what initiated the conflict. What seems to have initiated the conflict is the failure of political institutions and leaders in Jammu and Kashmir to handle pressure from an interventionist central government. It is, however, not yet quite clear why the government was so eager to get rid of Farooq Abdullah. The national security argument was, of course, important; at least it had been the official attitude of the central government to Sheikh Abdullah. But there were two other levels of conflict. There was a conflict between the state and the central government and there was a personal conflict between Farooq Abdullah and Indira Gandhi. Different observers lay differing emphasis on these as factors in the dismissal. The first perspective is of a general nature and could be characterized as mainly political, and recurs elsewhere as a reflection of the centralizing tendencies of the Indira Gandhi leadership. The deterioration in relations between the state and the Centre can be traced back to Farooq Abdullah’s decision to join an alliance of regional parties from all over India – the so-called Opposition Conclave. In May 1983 fourteen important political leaders, all opposing the Congress (I), had committed themselves to this alliance at a meeting headed by the charismatic N T Rama Rao, who had just won the election in Andhra Pradesh leading the Telugu Desam Party, and Rama Krishna Hedge, who had done the same in Karnataka with the Janata Dal. This was during the last leg of the election campaign in Jammu and Kashmir, but Farooq Abdullah took the time to attend the meeting and promised to host the next meeting of the Conclave. Indira Gandhi expressed her deep concern over Farooq Abdullah joining what was perceived as a national anti-Congress (I)-alliance. Never before had the National Conference opposed the Congress (I) outside Jammu and Kashmir. This was shortly after electoral cooperation between the Congress (I) and National Conference had broken down and Farooq Abdullah obviously felt he had to make new friends outside his own state. He kept his promise and hosted a meeting of the Conclave in Srinagar in October 1983. The theme of the meeting was State-Centre relations and the Conclave meeting that followed in Calcutta in January 1984 specifically focused on the problem of the central government’s attempts to remove the opposition government not only in Jammu and Kashmir but also in Tripura, Andhra Pradesh, West Bengal and Karnataka. The fears of the meeting were not unfounded. There are, however, others who point to a personal animosity between Farooq Abdullah and Indira Gandhi as the main reason for the dismissal. A less enigmatic answer is provided by the former Governor of Jammu and Kashmir, B K Nehru (in an interview in 1994), who is willing to comment on the deterioration in the relationship between Gandhi and Abdullah. It seems that Farooq Abdullah was set up to take the blame for the worst possible insult to Indira Gandhi, and he never managed to defend himself against the allegations. The story of the relationship between Farooq Abdullah and Indira Gandhi ends tragically here. 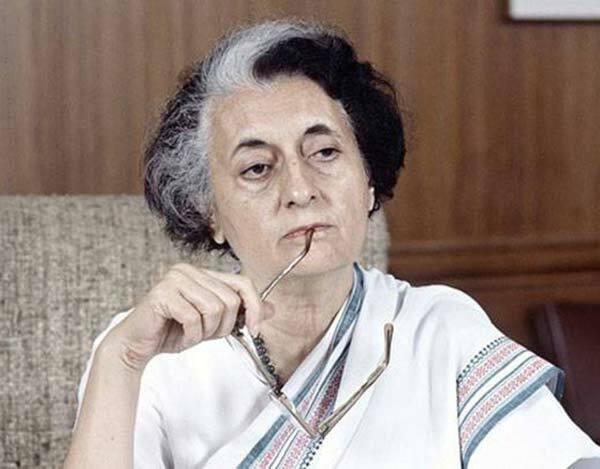 In a parallel development, Indira Gandhi was fighting against the Khalistan movement in Punjab, and only three months after Farooq Abdullah was deposed, she was assassinated by her Sikh bodyguard. There is nothing to suggest that democratic credibility could not have been restored from is point onwards, but over the next five years, the actions of the political elite in New Delhi and in Jammu and Kashmir steadily dispelled any hope of a continuation of democracy. 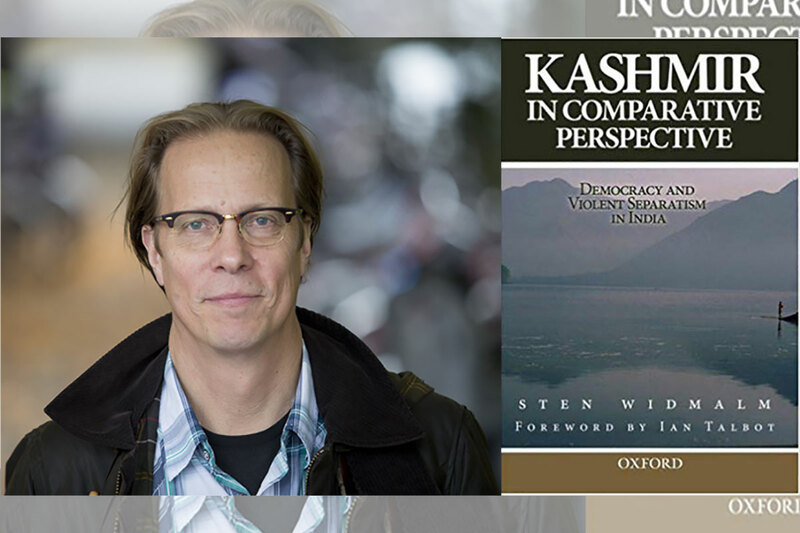 (The essay has been excerpted from Kashmir In Comparative Perspective: Democracy And Violent Separatism In India by Prof Sten Widmalm that Oxford Pakistan and Routledge Curzon UK first published in 2002).